It was hard to miss. Draped over the boardwalk at Jack Block Park on Saturday, a 300-square-foot cutout of a solemn face looked out over the water-based protest against the Polar Pioneer, the Arctic drilling rig floating in Elliott Bay. “Chief Seattle is watching,” it read. A star blanket presented to President Barack Obama during his visit to South Dakota last week carries a hidden message. The artist who created the quilt stitched “NO KXL” on the back. The message ensures that tribal opposition to the controversial Keystone XL Pipeline will always be present at the White House. That’s the first thing to know about Bethany Yellowtail’s work, a vibrant, elegant melding of classic style and the staples of her Native upbringing. Elk teeth line the sleeves of one gown, drawn with intricate floral beadwork, that drapes, glistening black, on the body of Jade Willoughby, an Ojibwe model from the Whitesands First Nation in Northern Ontario, Canada. All of Yellowtail’s collaborators are indigenous: Thosh Collins, the photographer, is Onk Akimel O’Odham, Wah-Zah-Zi and Haudenosaunee. Martin Sensmeier, another model, is Tlingit, Koyukon and Athabascan. 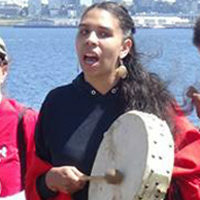 Promotional video director and poet Tazbah Rose Chavez, is Nüümü and Diné. And all have converged behind Yellowtail’s vision, a fashion collection that bears the unmistakable mark of Native American influence and history, but with a twist – it’s actually made by a Native American. A Native American high school senior is fighting for the right to wear an eagle feather as part of her cap and gown on graduation. Initially, officials at Lakes High said she’d have to hide the feather under her gown. “It made me really upset because it made me feel like I have to hide who I am,” Waverly Wilson said. On Friday, they softened their stance and told her can wear the eagle feather in her hair as an ornament, but she says that is not enough. Wilson is extremely proud of her Native American heritage.